This is our letter to Central Atlanta Progress (CAP), the not-for-profit corporation chartered to plan and promote Atlanta’s Central Area. It was impressive the way you drew Atlantans into a really good public process for getting involved with this update of the plan, combining electronic and in-person opportunities for engagement. And the final product has some great stuff in it, as we’ve previously mentioned. But these things need follow-through. Don’t stop when you’re on a roll, CAP! It’s frustrating to see you focusing so much on large-scale projects like The Stitch, the Gulch development, and the entertainment district — projects that were not emphasized in the DAMP. Meanwhile, the better goals from the plan aren’t getting much attention. A project like The Stitch is commendable, no doubt. Repairing the horrible divide in the urban fabric caused by the interstate is a fine goal. And while we’re certainly not opposed to the clear good that could come out of this project, we have to question why this is being prioritized now, versus other elements of the DAMP that aren’t being addressed. These goals above are taken from the DAMP, and they’re excellent. Neighborhood growth, quality of life improvements, urban forests, transportation choice, preserving heritage, supporting entrepreneurs — you’d be hard pressed to find anyone who lives or works in Downtown who doesn’t want those things. But when we look at CAP’s activities in the past year, we aren’t seeing things that address those goals. And that’s a problem. Here are eight ideas that align with those goals that you should be working on today! 1.) Get a “day shelter” open. Especially with the Central Library being closed long-term for renovation, there’s a huge need for daytime services for people dealing with homelessness in Downtown. That’s a Quality of Life issue of the highest sort. 2.) Save 152 Nassau. This is a no-brainer. If you’re interested in the heritage of this part of Atlanta that’s lost way too many old buildings, you should be active in preserving the ones we’ve got left, and this one even has some significant history attached to it. 3.) Get some other than student housing and hotels constructed. It’s happening elsewhere in Atlanta, why not Downtown? 4.) Plant some trees. We all know the benefits of greenery in urban places, and that canopy is part of Atlanta’s identity. 5.) Bring fewer cars into Downtown. Launch the equivalent of the Better Buildings Challenge for commute options – set a target and have companies compete to get workers out of their cars and celebrate wins. 6.) Lobby for parking tax/fees to cover public safety. We’re tired of hearing about the Clean Car Campaign. If crime is still a problem, make it go away by having tons of well-paid cops and fewer people choosing to drive and park in downtown. 7.) Support the arts community. Get Newport to use their TAD dollars to fix up buildings for artists to move back into. Pronto. 8.) Make Downtown streets better for people who aren’t in cars. Work on the fast implementation of complete streets, particularly on “car sewer” routes like Piedmont and Courtland. Don’t let ideas like these, ones that support the best goals from the Downtown plan, get hijacked and delayed by your drive for flashy, “world class” mega-projects! 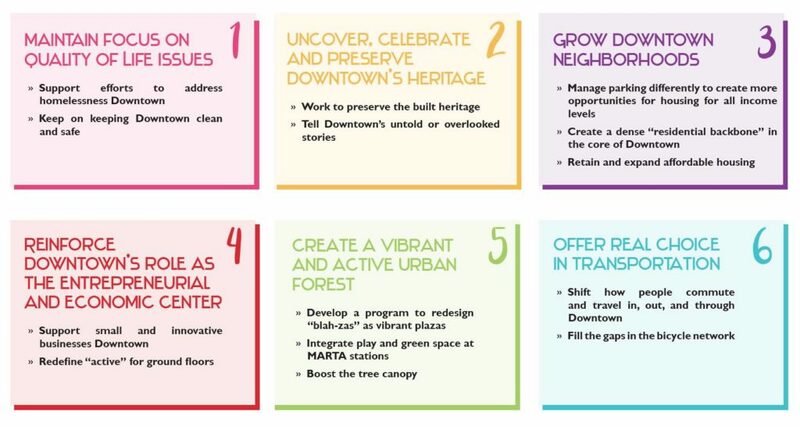 These incremental steps toward good urbanism and general improvements are at least as important for Downtown as the tentpole ideas. Remember: the cost of anything that gets built in Atlanta isn’t just about the cost of what we’re paying for. It’s the cost of everything else we could’ve done with the money instead. It’s not just about what we gain, but what we lose by way of misplaced priorities. That’s why we need to stick with the good goals from the DAMP! Those should be the guideposts for our investment in Downtown.